Kinesio tape (K-tape) is a thin, stretchy, elastic cotton strip with an acrylic adhesive. K-Tape works by lifting the skin, and creating channels of low pressure therefore, promoting flow of fluid from high to low pressure layers. By doing so, the Tape will reduce swelling and inflammation, equalize temperature and decrease pain. 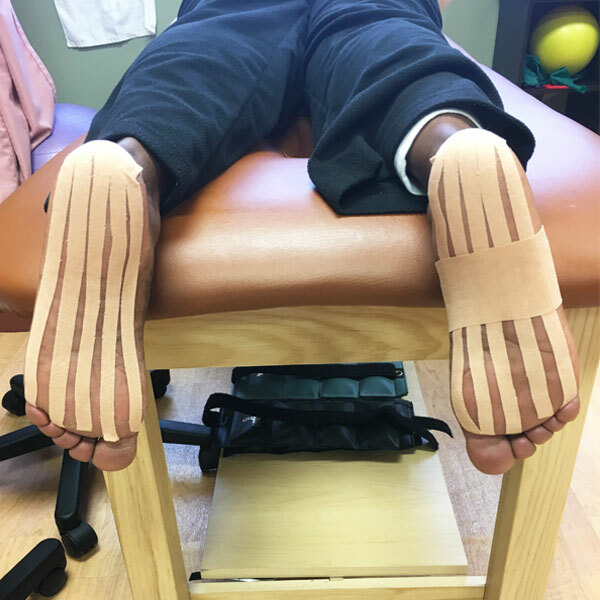 The Tape will work on muscles by increasing range of motion, improve muscle strength as well as reduce muscle spasms, support ligaments and tendons and allow faster recovery. Kinesio Tape is applied to a stretched muscle with appropriate tension added to the tape by the therapist. Therapeutic k-tape can benefit a wide variety of musculoskeletal and sports injuries, plus inflammatory conditions. It’s almost identical to human skin in both thickness and elasticity, which allows kinesio tape to be worn without binding, or constricting your movement. Kinesio tape has a comprehensive array of therapeutic benefits. Because it can be left on for several days or up to a week, these therapeutic benefits are available to the injured area 24 hours a day, significantly accelerating the healing process from trauma, injuries and inflammatory conditions. Dr. Karen Kondos’s (PT, DPT) primary professional experience has been in outpatient orthopedics with knowledge in sports medicine and musculoskeletal injuries. Dr. Kondos is certified in IASTM (instrument assisted soft tissue mobilization). She is skilled in kinesio-taping techniques and looking to obtain her certification. Karen received her doctorate of Physical Therapy degree at Long Island University-Brooklyn in 2011. Prior to that, she graduated from Kean University with her Bachelor of Arts Degree in Psychology in 2008. She was born in Alexandria, Egypt and moved to the United States in 1999 and has been living in East Brunswick, NJ ever since. Dr. Karen Kondos is a Physical Therapist with Central Jersey Sports & Spine and sees patients in Somerset, New Jersey. To read more about Dr. Karen Kondos, click here. To schedule an appointment please call 732-846-7000.